Bird Exclusion Netting installed under the Santa Monica Pier could have contributed to improved water quality says Heal the Bay. The Bird netting was installed under the pier to prevent birds such as pigeons from landing or nesting. When the birds were inhabiting the underside of the pier, an accumulation of droppings in the water was causing higher bacteria levels. “A combination of water-quality improvement projects including new storm drain infrastructure, runoff diversion replacement and the installation of bird exclusion nets under part of the pier, may have contributed to the drastically improved grades” in the End of Summer Beach Report Card, Heal the Bay said. Good news for Santa Monica Bay buffs: The quality of its water has improved since last year, Heal the Bay announced Tuesday morning. 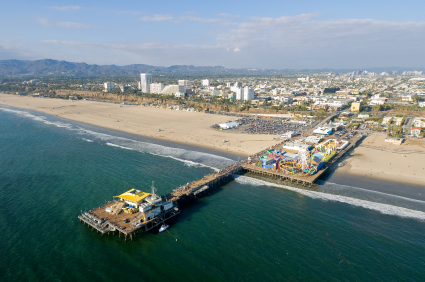 And in even better news for Santa Monica, the pier has earned an A grade for the second year in a row. The news was noted on the nonprofit’s End of Summer Beach Report Card, which tracks bacterial pollution from Memorial Day through Labor Day. During that time frame, Heal the Bay monitors and rates 447 beaches in California. Heal the Bay’s previous Beach Report Card, released in May, indicated the overall water quality at Los Angeles County beaches worsened in 2010-11. This summer, 89 percent of Santa Monica Bay beaches earned A or B grades, compared with 87 percent last year. In Los Angeles County, the number of A or B grades rose from 79 to 85 percent of beaches monitored. City officials joined New York Public Library President Paul LeClerc to celebrate the three-year, $50 million restoration of the Stephen A. Schwarzman building on 42nd Street on Tuesday. The landmark Beaux-Arts building, known to some as the Great Library Building or the People’s Palace, was designed by the architects Carrère and Hastings before it opened on May 23, 1911. But a survey in 2006 revealed severe deterioration and soiling of the façade, especially in the Corinthian column capitals, lion head keystones and scroll modillions. The architecture and engineering firm that did the survey, Wiss, Janney, Elstner Associates, Inc., said that the deterioration was mostly sugaring due to acid raid, diesel exhaust and pigeon guano, among other things. There was also roof damage, oxidation of the building’s bronze doors and cracking on sculptures. Birds had made the façade their home. The library decided to try to restore it. “Our intention was to make the building look like it was when it was built,” said LeClerc. After millions of dollars were raised, an architectural and conservation team set out to repair 7,000 instances of deterioration in 2008 on the 150,000 square-foot façade. Over three years, some 18,000 square feet of bird netting was installed. “Over 1,000 cracks were repaired. Over 2,000 hand-carved marble patches, or dutchmen, were installed and nearly 900 marble balusters were replaced,” said LeClerc. Many cities, municipalities and property owners install Bird Netting to protect historic buildings. Bird Netting is a humane way of blocking birds from getting to unwanted areas where droppings and nesting materials can ruin and stain facades and corrode building materials. Bird Netting is effective for all bird species and can be installed to keep birds off buildings, rooftops, eaves, warehouses, rafters and other areas. Heavy Duty Bird Net from Bird-B-Gone carriers an industry leading 10 year guarantee and is available in stock sizes and custom cuts. We also offer a complete line of professional grade hardware to ensure your bird net installation lasts.Visit us online at http://www.birdbgone.com/products/bird-netting/ or call us at 1-800-392-6915 for additional details. Don’t have the time, resources or staff to install bird netting? We have a network of trained authorized installers across the globe who can install bird netting and other bird exclusion products. Call us today at 1-800-392-6915 for an installer in your area.